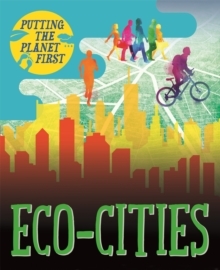 Discover how people all around the world are putting the planet first and helping the environment in new and exciting ways!From recycling drinking water to green transport links and renewable energy sources, cities can be adapted and built to be sustainable in all sorts of ways. In Putting the Planet First: Sustainable Cities, discover how people around the world are working all the time to innovate and create self-sustaining settlements. It's a fascinating introduction to the positive changes people are making to try and live more sustainably, and will inspire children to think creatively about how they can put the planet first!New, fresh series on green issues that will be both topical and timely. With the signing of the Paris Agreement, the environment is once again at the top of the global agenda, and this series taps into that. Both inspirational and practical, the series contains case studies of things people are already doing, as well as tips and ideas for things children can do easily at home or school. Recycling is a hot topic in schools, and there are lots of initiatives and schemes aimed at encouraging this, which this series will help to reinforce. Bright, colourful, engaging design and photography give the books real child-appeal, and will engage and hold their interest. Perfect for readers aged 7 and up.